Happy Monday! For reals. How was the weekend, dolls? Lovely? As you all know, we have finally moved to the 804 and are in the process of trying to settle ourselves. After each project that presents itself is 75% complete, I seem to come concoct another. Serial project dreamer. As I told the boy, I am typically the creative department and he is the execution. Some say it is all about the details, but I beg to differ. If you build it, they will come. Soooo, the boy seemed to imagine something on his very own AND executed it. A closet room. Woah. Woah. Woah. How and WHY did I not think of this? I let him take the project and run with it. I must say, we now have a room that resembles a boutique. It is my newest sanctuary (probably because it is the only room that is finished) and I cannot wait to share the end product with you all. Tomorrow. Tomorrow. I love you. Tomorrow. You're only a day away. I am truly obnoxious. Today and tomorrow. If you follow me on Twitter you probably already saw a little preview. 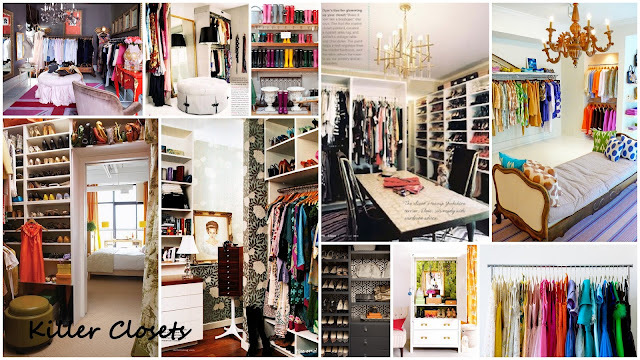 So until we can get to the real deal pretty, let's explore the world of some killer closets. Sorry for the brevity of this post, we are on the road AGAIN this week for graduation weekend. I will get it together. Eventually. Loves! You are the brains. He is the muscle. Perfect combo. And I think he gets the Man of the Year award for noodling that closet on his own. Can't wait to see it! We have to wait until tomorrow!! Can't wait to see what you two dreamed up!! Lucky lady!! That's pretty quick work after just moving, I'm impressed! Cannot wait to see it. It sounds fabulous! Your boy needs to talk to mine! Amazing! Cant wait to see the pics! OMG that sounds amazing!!! A closet room- wow! I can't wait to see what you dream up and he executes- LOL! Wow so jealous of the closet room!! My closet is itty bitty- can't wait to see the reveal! How fun! My office has become my husband's closet, but not in a glamorous way!! That man is a keeper! Hope you had a great birthday! YAY YAY YAY!!! Cant wait to see it! Goodluck this week with juggling craziness. if you need me to fill a spot and return the favor, let me know. until then, im dreaming of your closet sneaky peak!